Sometimes you have to just hold hands and jump. Moving in together, tying the knot … jumping out of a plane? No matter how you define a leap of faith with your partner, you have to give props to these eleven pairs who went to great lengths in the name of love -- from skydiving to swimming with sharks to some craziness with a surfboard. Bungee jumping: at least they had something to hold on to. Skydiving: Pros: plenty of opportunities for adorable shots like this. Cons: you could so die. 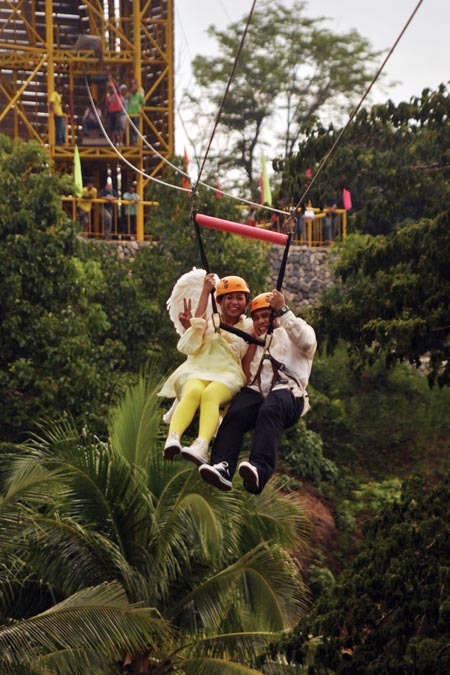 Zip line: One adventurous couple celebrated their 9th wedding anniversary with a tandem ride. Hang gliding: you know, you can have just as much fun on the ground. 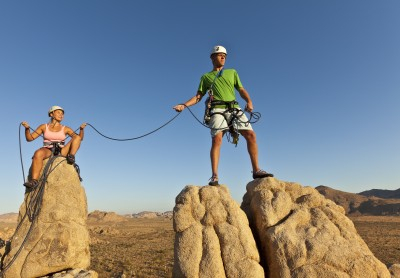 Rock climbing: just you, your honey, and a thousand foot drop.